Here’s just a little reminder for everyone, and some information for new members here: If you delve into the history of this blog you’ll find a number of ways you can contribute. The bookmarks competition finishes on New Year’s Day. Design me some bookmarks that use the Jon Sullivan artwork and display the eddress of this blog and you could be the winner of some signed copies. The winner gets the Cormac series and the Spatterjay series (new covers), second place gets the Spatterjay series, whilst the top three additionally get copies of my books that they haven’t got in their collection … oh, and when I say that, I mean any of the Macmillan books – all signed of course. I’ve been running a series of profiles and still want contributions. The title was ‘Who Reads My Books?’ For anyone who is interested, I’d like a short biography and some photographs of you. Tell me about yourself, advertise if you want, if you have a blog or a website of your own then let me know. Thus far (if my recollection is right) we have plenty of IT guys, a pilot, a geneticist, writers, a composer, jewellery maker and much more besides. But don’t be intimidated by these – I want to know about YOU and your interests. Remember, before I got where I am now I used to cut grass for a living. It’s also interesting to see photos of people’s SFF collections. I enjoy having a look at them and so do many of those who come here. Let’s have a look! Finally, I’ll shortly be doing another video clip to post up here so I would like some more questions. I’ll answer as many of these as I can within the 10 minutes allowed (You Tube) then carry over what’s left to the next clip. Post your questions in the comments section here. Via Skype I recently did an interview (voice only) with some people at the University of Wisconsin. Here’s the link to it. I think I babbled a lot — too much coffee and too many cigarettes! This week we bring you our third installment of our podcast series. 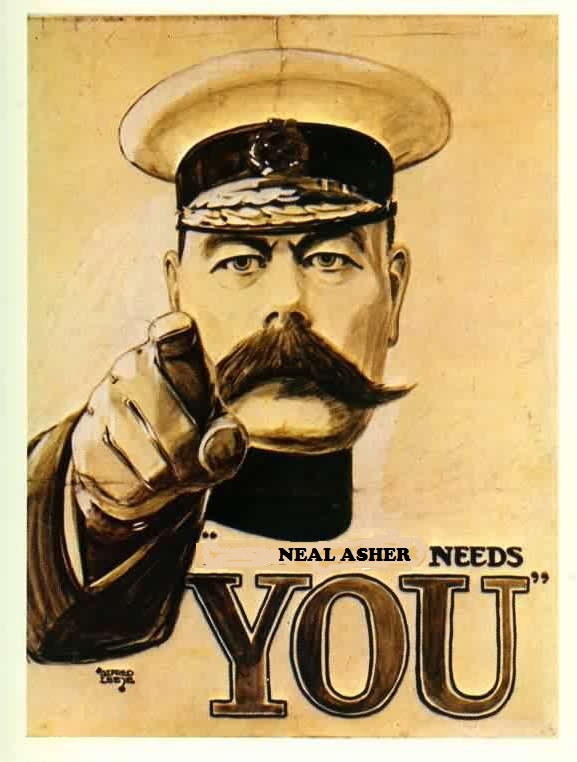 This week we’ve interviewed novelist Neal Asher. 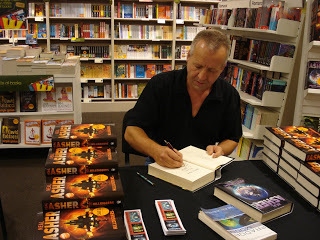 The interview runs about 43 minutes and in it we discuss Mr. Asher’s writing process, his love of science fiction, as well as some of his upcoming works. Here’s an old interview I did for a Czech magazine or website (can’t remember which). 2. You use quite a lot of violence in your books. Or perhaps I should say it better this way: You are able to make up amazing, hard-to-beat- villains and monsters. Where do you find the inspiration for them? Have you read – and enjoyed – Harry Harrison’s Deathworld series? The world is mostly ocean, where all but a few visitors from the Human Polity remain safely in the island Dome. Outside, the native quasi-immortal hoopers risk the voracious appetite of the planet’s fauna. Somewhere out there is Spatterjay Hoop himself, and monitor Keech will not rest until he can bring this legendary renegade to justice – for hideous crimes commited centuries ago during the Prador Wars. Keech does not know is that while Hoop’s body roams free on an island wilderness, his living head is confined in a box on board one of the old captain’s ships. Janer, the eternal tourist, is bewildered by this place where sails speak and the people just will not die, but his bewilderment turns to anger when he learns the agenda of the Hive mind. Erlin thinks she has all the time she will ever need to find the answers she requires, and could not be more wrong. And so these three travel and search, not knowing that one of the brutal Prador is about to pay a surreptitious visit, intent on exterminating witnesses to wartime atrocities, nor do they know how terrible is the price of immortality on Spatterjay. As the fortunes of the recent arrivals unwittingly converge, a major hell is about to erupt in this chaotic waterscape … where minor hell is already a remorseless fact of everyday life – and death. 6. One of the most influential NSO writers seems to be Alastair Reynolds, whose novels started to be published one year sooner than yours. You use some similar methods and properties, such as “melding plague” and “nanomycelium”. Has it ever happen that some reviever used these similarities against you? One day I intend to rewrite those fantasy novels and offer them for publication, but at present I’m heavily involved in the Polity universe and will keep on writing novels set in it while Macmillan continues offering me contracts. I like to think the fantasy novels would be of interest to many readers and did want to give myself a breathing space so I could turn my attention to them, to a contemporary novel I wrote some time ago, to my TV scripts, but that seems increasingly unlikely. One book a year for Macmillan may soon be changing to one book every nine months, I’ve got short stories and novellas I need to write because I already have a market for them … so much to do and so little time.